CPAC Convention, Washington -- Conservatives could learn a lot from Tiger Woods' wife Elin, Minnesota Gov. Tim Pawlenty said at the Conservative Political Action Conference today. "She said, I've had enough," Pawlenty said. "We should take a page out of her playbook and take a 9-iron and smash the window out of big government." Following Tiger Woods' car accident in the early morning following Thanksgiving, Elin Woods smashed the window of his SUV in order to free her husband. Pawlenty, speculated to be a strong contender for the GOP 2012 presidential nomination, made the remark during what was seen as a key speech as he seeks to court conservative activists ahead of a possible run. But he was obviously cognizant that his speech would likely be overshadowed today by Tiger Woods' first public remarks since it was revealed last year that he had a number of extramarital affairs. In his remarks, the Minnesota governor railed against politicians in Washington for increasing the national debt, going down "on rhetorical bended knee" in front communist China. "The United States of America is not a beggar nation," he said. Pawlenty told a personal story very similar to President Obama's, about his mother dying of cancer in her 50's and struggling over bills in her final years. "It was hard, and it was challenging," he said. Yet he said it gave his family perspective about spending. "That perspective is not reflected in the current administration," he said. Taking a combative tone against President Obama and Democrats in Congress, Pawlenty nevertheless said, "We love this country [and] we don't wish it ill will." If Republicans are going to return to power in Washington, he said, they need to "walk the walk." It won't be easy, but it is possible to curb spending, Pawlenty said, noting that in Minnesota, the spending curve is down to zero. As previous speakers have here at CPAC, Pawlenty joked that the snowstorms that devastated the Washington area, costing the local and federal governments huge sums, were beneficial because "any day that Harry Reid and Nancy Pelosi can't get to work is a good day for freedom, a good day for liberty, and a good day for people's wallets." He also accused the president of being too soft on issues of national security, saying that the president of France is lecturing America on "the dangers of appeasement." "That is like AIG lecturing us on financial responsibility," he said. "I have a message for President Obama: Mr. President, no more apology tours, and no more giving Miranda rights to terrorists." 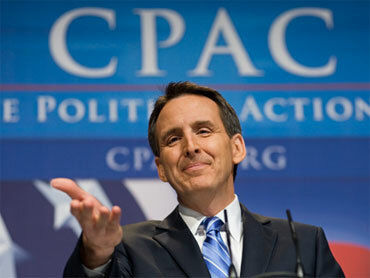 Pawlenty said conservatives also have a message for liberals: "If you try to take our freedoms, we will fight back." Pawlenty also took at swipe at Mr. Obama by referencing another big event going on now – the Olympics. "If government spending were an Olympic sport, [Obama] would be a repeat gold medalist," he said. Pawlenty brought the crowd to their feet warning Democrats that Republicans were "planting the flag on constitutional ground" and that if they try to take away their freedoms "we will fight back." Mitt Romney: Obama's Agenda Is "Reckless"